In the recent past, mBot has gained popularity as an entry to the intermediate level robotic kit for school. mBot is an easy-to-assemble educational robotic kit that helps students learn real-world applications in robotics. Teachers have been using mBot as a STEM educational kit for teaching electronics, programming and robotic concepts of varying complexity levels. mBot can be programmed using graphical (Scratch based) and coding (like Arduino). This makes students learn the basic concepts easily and then move to solve problems of higher complexity levels. This course provides you an introduction to mBot hardware and other electronics components on-board and helps you assemble the mBot. Using the coding exercise, you can program your mBot to perform real-life robotic applications. mBot is an STEM educational kit for learning electronics, programming and robotic concepts of varying complexity levels. mBot is an easy-to-assemble educational robotic kit that helps students learn real-world applications in robotics. mBot is also known as modular robot for adults, for it supports an extension of the robot through MakeBlock and modular system compatible mechanical parts and open-source electronics. Computer/Laptop with Windows or MAC Operating System with mBlock software. This course mainly contains the programming exercises required to familiarize you with basics of graphical programming, programmable components of mBot hardware and controlling of mBot to make useful applications. Combine your imagination and programming skills to create useful applications like a line-follower robot, autonomous obstacle avoidance robot etc. 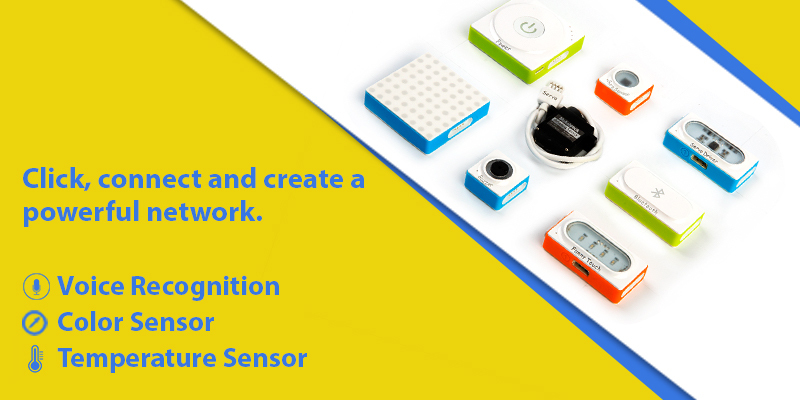 For a classroom environment, where multiple mBots are available, one can even think of creating games around mBot programming – for example, soccer playing mBots, balloon fight, and autonomous maze navigation completions. Base Shield – An expansion board to connect Grove modules.